Erwin Clausen was born on 5 August 1911 at Berlin-Steglitz. He joined the Reichsmarine in 1931 but then transferred to the Luftwaffe in 1935 to receive flying training. Feldwebel Clausen was flying with 3. (J)/LG 2 and scored his first victory during the invasion of Poland when he shot down a PWS.26 biplane trainer on 9 September 1939. He was to score further victories during the French campaign. 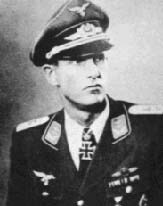 On 1 February 1941, Oberleutnant Clausen was appointed Staffelkapitän of 1(J)/LG 2. When 1(J)/LG 2 operated in support of the invasion of the Balkans, Clausen was to score three victories over JKRV Furies on 6 April 1941. Following the Balkan campaign Clausen withdrew with the unit to Eastern Europe. On 6 January 1942 1(J)/LG 2 became 1./JG 77. With 1./JG 77 in Russia he was particularly successful. On 2 July 1941, he shot down two Russian aircraft for his 7th and 8th victories. By the end of 1941 his total had reached 18. He recorded his 20th victory on 16 January 1942 and his 30th on 24 February. On 9 March, he shot down five enemy aircraft to record victories 36 through 40. He was awarded the Ritterkreuz on 22 May after 52 victories. On 27 June, he was appointed Staffelkapitän of 6./JG 77. He achieved 45 victories in July including four in a day three times, five in a day twice and six in a day once. Clausen shot down his 100th opponent in claiming six in a day on 22 July 1942. He was awarded the Eichenlaub (Nr 106) the next day. Clausen was transferred to Erg.Gr.Süd on 1 February 1943. Hauptmann Clausen became Gruppenkommandeur of I./JG 11 on 20 June 1943 performing Reichsverteidigung duties. In July 1943 he shot down eight four-engined bombers. On 4 October 1943 he shot down B-24 Liberator but then he was killed in aerial combat over the North Sea attacking Allied four-engined bombers in Fw 190 A-5/U12 Y (WNr 7358) “Black <<” . Erwin Clausen is credited with 132 victories achieved flying 561 missions. He recorded 1 victory over Poland, 3 over Jugoslavia and 14 victories over the Western front. His score includes 12 (and probably further unconfirmed) four-engined bombers and 18 Stormoviks.